A 12 piece children's set for the little helper in your shop! 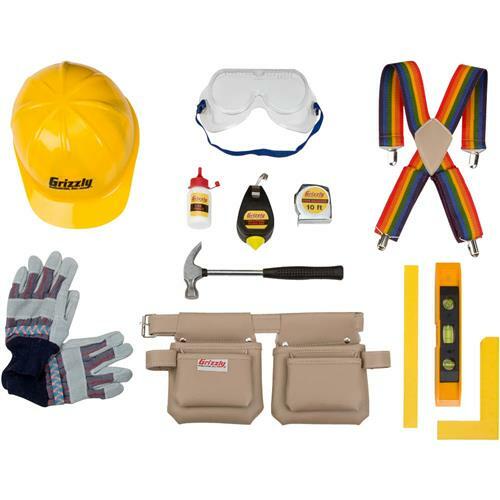 Set includes: 4 pocket vinyl tool belt with 2 pouches, 9" magnetic torpedo level, 6 oz. claw hammer, 10' tape measure, 6" try-square, chalkline/plumb bob, 4 oz. bottle of chalk, 10" ruler, durable leather gloves, safety goggles, adjustable hard-hat and suspenders. Great fun for kids ages 8 and up. I bought 2 sets of these for my boys for Christmas so they could work with Daddy in his workshop. I couldnâ€™t find anything remotely comparable to the price, quality and contents on Amazon or anywhere else for that matter. I was happily surprised to find the tools and equipment were all real. The snap line came with chalk and the tape measure was an actual retractable tape measure. I love this product and so do our boys. 5 Stars all the way. My Grandson couldn't wait to get all of this out of the package and around his belt! He said he looked like a "professional" with it - very well received and the kit components are good quality. The only "negative" is the heavy plastic which must be cut to get it loose from the package. Be prepared for that! 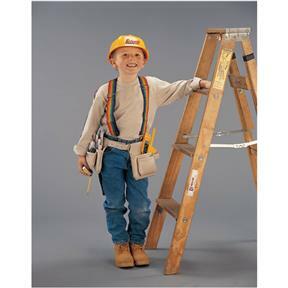 Great quality, kids love that they can help Dad with work operations and learn how to properly use tools. Great learning aids including safety hard hats! Impressed with the quality of this product . Would highly recommend. I bought this for my grandson because of the other reviews I read, and they were right! This is a very nice set, and functional as well. It makes for more of a hands-on teachable reality than just a play set. For the price it's fantastic. I was so excited about finding this on line for $19.95...and was even more excited when I opened it and saw the quality. You have a wonderful product and it was perfect for my nearly four year old grandson. He likes to "work" with his Papa (my husband) and he really works...wish the older siblings would take note, ha, ha. This set is so far above what I expected to find for the price. And, thanks for the catalog. You have a lot of "stuff." I must thank you, again, for the fantastic gift (two hats). It could not have come at a better time. Charlie was very sick with terrible fever. He was lying in his bed, and had just woken up when the hats arrived. He took the hat from me and put it on his head and he smiled as largley as he did Christmas morning. He was so happy to get ANOTHER gift from "Santa's" workshop.....(Because you understand, that Grizzly does some of the work for Santa, sort of a sub-contractor/toymaker) I had to explain that to him of course. When I mentioned to him about using his picture on the website he said "that's OK".......I too, would be honored to have his photo on the website. So, since I have been buying your products I have been extremely satisfied with both the quality of the products, and the customer service you have shown, Charlie too. As I look to the future in the construction industry, I am poised to expand my woodworking company and I will be looking to Grizzly for that purpose. I have been looking at your 17" bandsaws, and will likely be making that purchase once the financial forecast is a bit more promising. I recently received a shaper machine as a gift from a retired woodworker, and I purchased a "Stile and Rail" set, model number C2164. It has already paid for itself and I will be purchasing more shaper cutters as well as many other products in the near future. You have certainly solidified my decision.